Frances Stern sounds as if she’s on the verge of pulling her hair out in frustration. 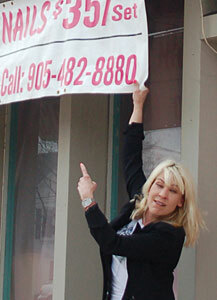 The owner of 2 Hot Blondes Hair Salon in Thornhill says she’s being picked on in an unfair fight over signs. “Why single me out?” she asks rhetorically from a couch in her Yonge and Centre Sts. store. “I feel discriminated against. Stern’s offending signs are promotional banners she hangs a few times a year on the salon’s facade. The City of Vaughan’s sign bylaw is enforced on a complaint basis, meaning an otherwise illegal sign can stay up as long as no one brings any attention to it. It’s a routine that’s been going on for years, he adds. “We keep warning them and they basically said, ‘We’ll do what we want’,” Shefman says. “The fact is we have a very strict sign bylaw and we will uphold that bylaw. The city has been very lenient with 2 Hot Blondes, he adds. Stern rents space in her salon to a nail technician and an aesthetician, who are tough to come by, she says, because so many like them operate in the underground economy. The banners are meant to bring in new business for them, she says. “If you rented from me and you couldn’t advertise your business, you wouldn’t be here, point blank,” Stern says. “This is my complaint: Let me operate my business legal, like I do. According to the city, 21 sign bylaw complaints have been made in Ward 5 so far this year. Stern, though, says that number would be much higher if the bylaw were applied fairly. Armed with a stack of photos, Stern points to several other Thornhill businesses — including a car dealership, a grocery store, a bank and a coffee shop — that seem to get away with flying the same sorts of banners she keeps getting warned about. “Everybody else can run a great business but I can’t,” she says. “I don’t care what other people do. What’s puzzling, Stern says, is that 2 Hot Blondes gets special attention. “It’s a historic district (and) people have a huge stake in that area,” Shefman says. “That’s why they’re being complained about all the time.